We got our idea for the November block raffle from the Madison Modern Quilt Guild which is where the photo above and instructions are from. Here is the pattern for the block from the blogger Don't Call Me Betsy. Here's how the block raffle works: You can bring 1-2 blocks to the November meeting. Each block gets you one entry into the lottery. If your name is pulled, you win all the blocks! Usually it is enough to make an entire lap-size quilt. This month use a gray background - solid or a "reads as solid" print and pick ONE color for the "O" part of the block. It can be scrappy, but should read as one color, similar to how the block above more or less reads as purple. Please note: The pattern calls for using eight (8) 4.25" background squares with eight (8) 4.25" color squares. The method used for making the half square triangles results in 16 HST units. Only eight are needed per block. 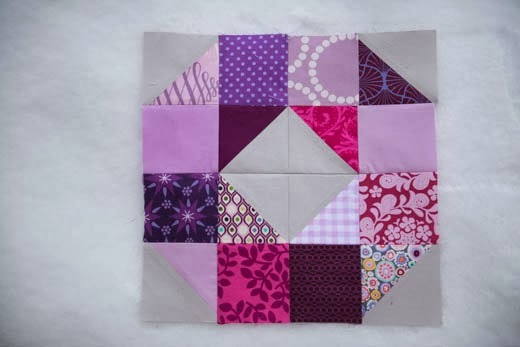 You could either use a different method for getting single half square triangle units or you could cut out another eight 3.5" purple squares and use the extra half square triangles to make an additional block!